• An all-in-one bushcraft and survival firestarting tool that excels in harsh outdoor conditions. • The combination of Hot burning Magnesium, globs of hot sparks from the ferrocerium rod and the natural waterproof pine resin fatwood handle allows for simple firestarting capabilities in any weather conditions mother nature can throw at you. • Easy to use by scraping off a little of each meterial with a knife or sharp edge, add a hot spark from the ferrocerium rod provided and you will have a hot sustainable fire. • Clip to any bag with the 4DB camouflage carabiner and fire tinder 550 paracord lanyard. • 34″ snake braid deep woods fire tinder 550 paracord lanyard. This multipurpose paracord has an eighth inner strain of jute twine tinder that allows you to always have a tinder source with you that will easily catch a spark from the ferrocerium rod and start your fire. 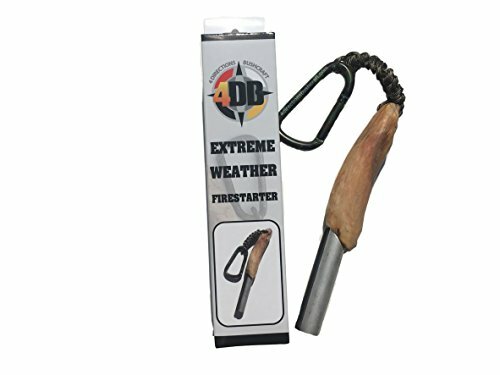 • Each Extreme Weather Firestarter has it's own unique look and is hand carved. They are approximately 6-6.5" in total length. This does not include lanyard and carabiner. • Magnesium burns at an extreme temperature of 5,610 degrees fahrenheit and the ferrocerium throws sparks that reach 5,430 fahrenheit. Combined these are the supreme firestarter. Carry fire with you at all times and the security of 4DB quality firestarters.